There was a time when the only power available to civilization was muscle and wind. Once the force of the wind was harnessed, oceans became the means to discover everything that was within our grasp. Imagine that it is some time in the early seventeen hundreds and the world is dominated by wooden ships with massive sails. Now travel with me through time and merge the music of composer Catherine Duc. We join her and her album Voyager as she travels around the globe using her delightful compositions. No port is too remote, no island too inconsequential, and no mountain too inland to ignore. Keep in mind that once we get on land we might use other conveyances. Voyager offers us elven Celtic and World songs using flute, violin, keyboards, guitars, cello and Uilleann pipes as well as some whispery and sung vocals. Let us begin the journey. With a wash of ocean waves and flourish of Kelly Hood's Uilleann pipes, the opening song Owen's Boat begins. I felt as if I was drawn into a Lord of the Dance scenario with this uplifting tune. The music promises so many things; adventure, danger, and fortune of many kinds. I was thrilled to be on board. Off the northern coast of Ireland is the peninsula known as Inishowen. Inishowen Dawn is the place where everything starts. As she rises, the sun becomes a golden mistress to the day as the seas rise to meet us. The ancient ring fort crumbles in the distance, but it is remains a reminder of the history of the most northern point in Ireland. 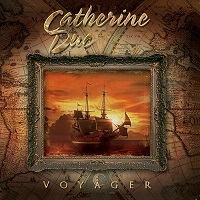 Catherine's high seas tune sets an even tempo, as if we sail to the beat of a drum that can be heard around the world. We travel south to the coast of Spain where we see on the shoreline the caravans of the Romani. Each wagon or vardo is covered with ornamentation and carvings that tells the story of each tribe, each family. Duc offers up the tune Vardo which sounds mysterious and dark. The music is sultry, sensual and somehow, forbidden. The exotic sound reminds me of a melodica, but it is violin and I liked it for its uniqueness. Once is one of those highly charged tunes that takes on an Arkenstonian sensibility. There are swords and sorcerers, secrets passages, and primitive magic. Merlin is somewhere about, The Lady Viviane is missing and the search begins. The oak tree has witnessed everything, but it loath to give up his secrets. Next, we find ourselves in the sparkling blue Caribbean Sea as we visit the Americas in the tune, Antilles. As the music surges forward, we can feel the wind at our backs, the sea rushing past the bow and the sky filled with clouds that has a daydream in each and every one of them. We travel around the globe to the Bay of Bengal. We alight from the ship and travel northwest to Tibet. Sacred Tibetan chants and Chinese flute accompanies the tune Lhasa Lullaby. Our leader is quite brave, for she takes us to lands heretofore unexplored. Perhaps we search for Shangri-La or maybe the secretive Guge. How we found ourselves here, I will never know. The leader decided to explore this system of caves, darker than the heart of a villain. With only our torches to guide us, we entered. One room after another. Another, another, until we reached The Seventh Chamber. Catherine's tune The Seventh Chamber is haunting and melodramatic. The danger is palpable and we fear what is around the next corner. It has a touch of the cinematic, but that added to the character. Finally, Catherine offers up a bit of what is called mouth music in Seallaibh Curraigh Eoghainn. The sound is a vocal version of Owen's Boat, the opening tune. It was written originally as a strathspey, but Catherine converts it into a hardy ballad with her sweet bewitching vocal and with the help of Ian Cameron's capable guitar. I enjoyed every track on Voyager, and truth be told, I have listened to it for many months out of pure enjoyment. It is a Celtic flavored mix that seems to be rare these days. The strength of Irish traditional music is not to be ignored, but story song with a Celtic flair is a case to celebrate. I would encourage every listener who likes Clannad, David Arkenstone or Jeff Johnson and Brian Dunning to pick up this album. Catherine Duc proves herself to be not only a superb storyteller, but a brilliant musician and arranger. Thank you Catherine. For the voyage.